We manufacture rigid uPVC pipes as per IS: 4985 : 2000. These pipes are recommended for water temperature up to 45°C. All the PVC pipes are subjected to different tests as laid down in BIS Standards. These pipes are available in the range of 63mm to 250mm in 4 to 10 kg/cm2 working pressure. KALSI PVC pipes prove to be the perfect choice when it comes to quality as we use high quality raw materials that provides structural stability and enable high performance. Systematic quality planning in the development of processes, use of latest testing equipment and comprehensive quality control in production, processes etc. provide sustained superior quality. 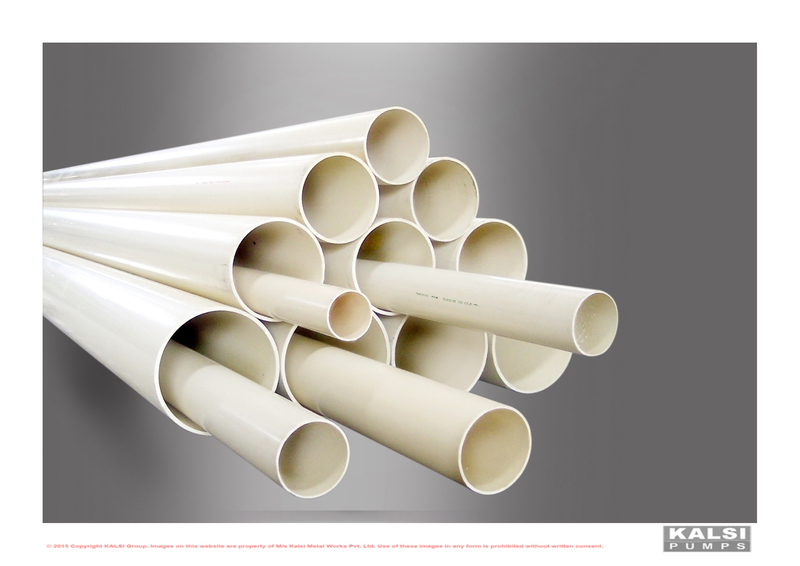 Light Weight : Kalsi PVC pipes are light in weight and make material handling very easy. Durable : These PVC pipes are durable and have long life. They are resistant to corrosion. Facilitates Flow : These PVC pipes are designed for less friction loss and facilitate maximum flow, preventing blockages. Cost Effective : These PVC pipes are cost effective.